Hi loves! I was able to attend Generation Beauty San Francisco. For those of you who have never been to the bay area, let me tell ya- it’s busy! When deciding on where to stay, I thought I needed somewhere centralized and different than where I usually stay. I did a lot of research on areas to stay, amenities, etc. I found Aloft SFO. Aloft is close to the airport with shuttle services to take you to areas in the vicinity. If you have never heard of Aloft hotels, they’re part of Starwood Hotel and Resorts. Their hotels and resort also include the Westin and Sheraton. Aloft hotels are very modern, trendy, and chic. I found Aloft SFO to be a rather large property with lots of communal areas. Upon arrival, the staff were very friendly and accommodating. They provided information on Filipino restaurants and must try desserts shops in the area. What can I say, they spoke my language! An extra bonus to staying at Aloft was the security this hotel offered. My room was located on the 4th floor, and to gain access, you needed to have a key card. A little relief knowing that you have to be a guest of the hotel to get to the upper floors. The rest of the grounds looked up-kept, modern, and beautiful. You can chill in the lobby, play a board game, have a drink at the bar, or if you are lucky- catch one of the live shows offered at Aloft SFO. There is also an indoor pool, a couple of lounging areas outside, and a pretty amazing gym. I would have gotten a picture, but there was always someone using the facility when I was there. Creepin’ is not my thing, lol! I stayed in a non-smoking: King bed room. I love how they incorporated the city with the room decor. It really works with the environment. The rooms are larger than others I have stayed in, which was great! What I enjoyed the most, was the bathroom! You get a large step in shower with a rain faucet. Aloft showers did have something I have never seen before- shower gel and 2-1 shampoo & conditioner dispenser. There are pros and cons to this because it saves product and helps with cost. However, it does take away from taking home the little mini’s most hotels provide. Normally, I wouldn’t care, but they use Bliss products. The view was alright, just pool lounge area. 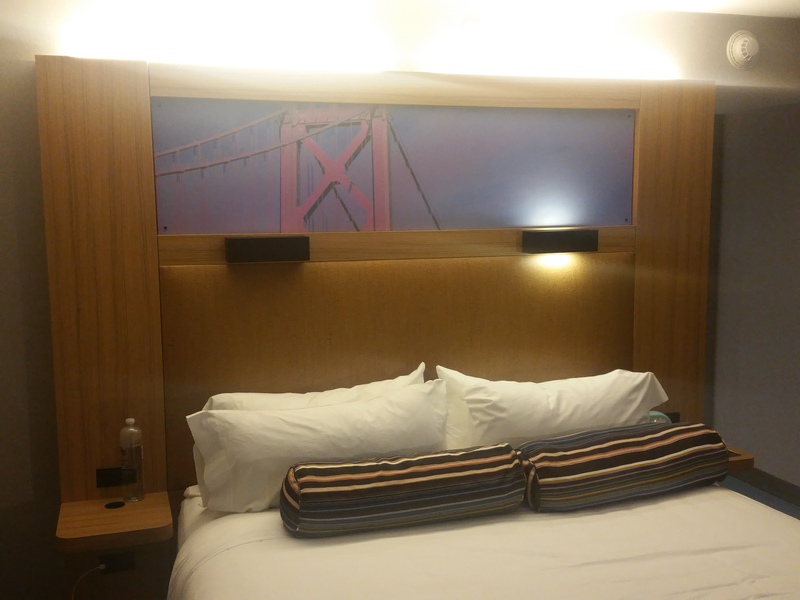 Overall, I really enjoyed my stay with Aloft SFO and definitely plan on staying again. It’s a great place for single travelers, couples, and families. All based on the atmosphere alone. It’s also pet-friendly. With my most people, this is a huge plus. I hope you enjoyed our review on Aloft SFO. Have you stayed at an Aloft before? If not, what’s your favorite boutique hotel?